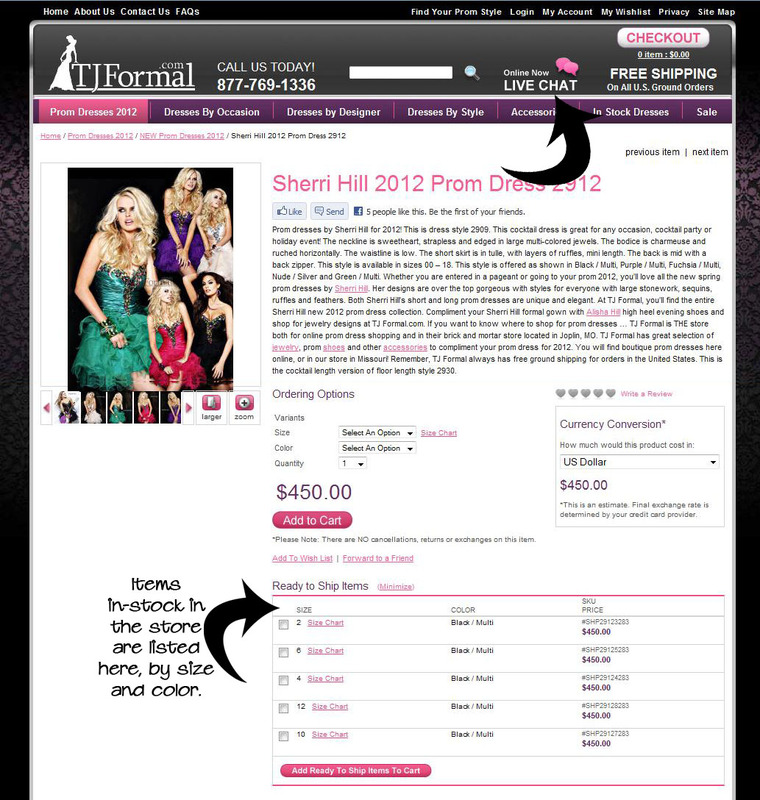 TJ Formal Dress Blog: Is your prom dress in stock? See how to check! We have thousands and thousands of dresses on our site! While we also carry thousands of dresses in our retail store in Joplin, Missouri, it is not possible to stock every dress, in every size, in every color. That is over a billion dresses! Yes, we counted. So, to avoid having us tell you your prom dress isn't available to get by your prom date and canceling your order, check stock with us first. Here's 3 different ways. 1. Send us an email by going to our Contact Us page where you can see the information you need to send us: manufacturer name, style number, size, color choice, and wear date. This gives us all the information we need to check if we can get your dress. Click on the Email TJ Formal link and send us the info. In a short time we will email you back to let you know if we do have your dress in stock. Any dress we have in stock in the store can be shipped out the same day you order it! Wow - that is fast! This is the best way to contact us during off-hours and especially for our international customers on different times zones. ...and ask one of our very friendly and helpful operators if we have it in stock. The operator will check stock in our store and if we don't have it, she checks stock with the manufacturer to see if it can be special ordered. Sometimes the operator can check stock with the manufacturer quickly and will tell you in live chat right away, while other times it takes longer and she will ask for an email address so she can email you the availability. If a dress is not in stock either in our store, or with the manufacturer, we will let you know if it is still a current style and can be made (please allow 8-12 weeks for production time!) or if it has been discontinued and is no longer available. 3. Call the store: toll-free in the store 877-769-1336 (417-623-4333 for international customers) and we can check stock for you. Now you are ready to place your order. You know which prom dress you can get in time for your prom. But you need to do it quickly! Even though we could get your dress when you checked with us, it doesn't mean it won't get sold to someone else before you place your order. So it's a good idea to place your order quickly after you check with us on availability. If you wait even a day, there is a chance the dress will be sold. If you are not ready to order right away, then hold off on checking availability until you are ready. 1. Send us an email from the Contact Us page. 3. Call us toll-free in our store 877-769-1336. Try one of these ways, then order quickly, and you will have the best chance of getting your perfect prom dress! For more information about checking availability and deilvery, see our FAQs.